CHAMPAIGN, Ill.— With the Big Ten regular season winding down, the No. 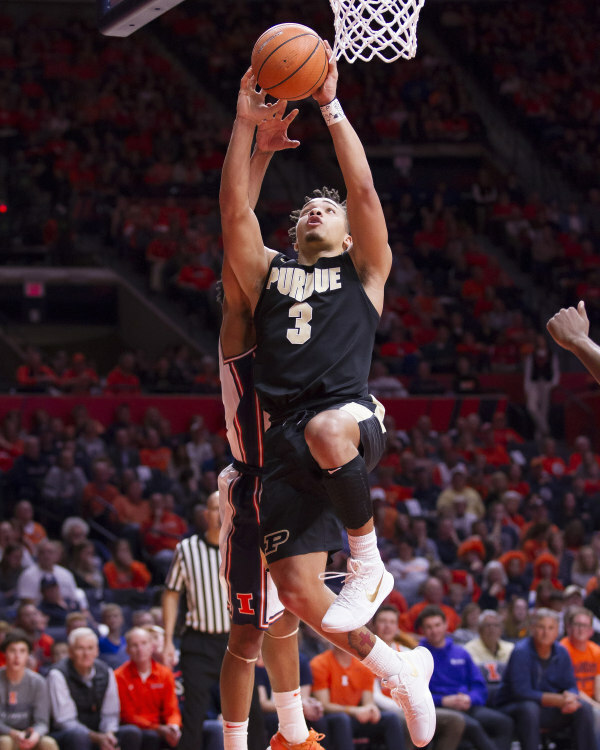 9 Purdue Boilermakers (25-5, 14-3 Big Ten) looked every bit of a team ready to make a run deep into March with a 93-86 win over the Illinois Fighting Illini (13-17, 3-14 Big Ten) behind a career-high 40 points from Carsen Edwards. With senior Vince Edwards (ankle) out for the second straight game, Carsen Edwards followed up a 27-point outing against Penn State on Feb. 18 with a historic performance which he became the first Purdue player to score 40 points since Glenn Robinson's 44 against Kansas on March 24, 1994 in the NCAA regional semifinal. Despite leading for the majority of the game, Purdue kept the advantage in single digits, which Edwards knew his performance would have meant nothing had the outcome ended with a loss. "It was such a tight game and even if I played the way I did and still lost, it would not have been as special to me," Edwards said. "We got some big shots and stops and glad we came away with the win." Trent Frazier finished with 20 points and five steals, but acknowledged Illinois' inability to stop Edwards throughout the game. "We made it a little too easy for [Carsen] tonight," Frazier said. "He made a lot of tough shots and is a big player for them." Free throw shooting proved to be as vital in the win for Purdue going 26-of-31, with 22 of those makes in the second half. "The one thing we wanted to do was be aggressive," Purdue coach Matt Painter said. "The more we can be aggressive, the more we can get into the bonus. It is also driving the ball and when you can finish at the rim and you have to pull up, now for an aggressive team, it is hard for them not to foul you or keep them in front of you." Four Illini players finished in double figures scoring, with Leron Black as the high man with 28 points, on 12-of-25 shooting in 30 minutes. While Edwards made shots for the Boilermakers, the Illini countered with timely baskets as they took an 18-13 lead at the 13:38 mark of the first half. Both teams would shoot at high levels and exchange leads on multiple occasions in the first half until Purdue struck with a 10-2 run, spearheaded by back-to-back triples from Dakota Mathias to go ahead 31-24. Purdue appeared to be in cruise control with a 40-28 lead in the late stages of the first half, but Illinois countered with a 10-3 run to go into halftime down 43-38. The Boilermakers also aided the Illini’s run by missing four of their final five field goal attempts in the half. The Illini continued to attack on offense to start the second half as their relentless pressure on defense forced the Boilermakers into three turnovers as they kept the deficit under five points. "We have had some runs against us all year and were fortunate that last shot from Mark Smith [at the end of the half] did not go down," Painter said. "The turnovers at that stage really hurt us, especially the live ball ones." A lethargic pass from Purdue’s Grady Eifert evolved into a turnover and a three-point make from Frazier to give Illinois a 53-52 lead— their first since the 9:58 mark of the first half. Frazier dazzled the home crowd on Illinois’ next possession with a crossover and step back three-pointer from the wing to tie the game at 56. An 8-0 run by Purdue temporarily silenced Illinois as Edwards continued to carry the offense with a 64-56 lead with 12:41 left in regulation. The Illini would get no closer than four points of the Boilermakers as the penultimate game of each team's conference slate comes to an end. Purdue keeps its hopes alive for a share of the Big Ten regular season championship and needs a win against Minnesota and a Michigan State loss to Wisconsin in order for things to come to fruition. Both teams close out Big Ten regular season play on Feb. 25 as the Illini travel to Piscataway, N.J. to take on the Rutgers Scarlet Knights for a 2 p.m. tip (BTN), while the Boilermakers honor their seniors at Mackey Arena against the Minnesota Golden Gophers at 3 p.m. (FS1). Follow College Sports Overload on Twitter @CSportsOverload. Follow Geno Green on Twitter @TheGenoGreen.